VP80-MP pumps have 4 vacuum ports that distribute vacuum equally to 4 locations with direct “Home-Run” plumbing. The streamlined design minimizes vacuum loss, maximizes vacuum flow and speeds cycle times for safe, efficient lifting operations. In addition to the 4 topside vacuum ports, there is a port fitted with a glycerin filled vacuum gauge (standard) and another port that can be plumbed to a compressed air source to provide a blow-off. 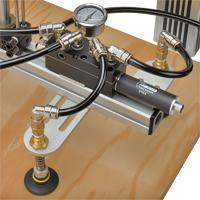 The manifold design allows one compressed air connection to feed blow-off air to all vacuum locations simultaneously, saving the need to plumb separate blow-off lines. Dimensional data for the VP80-(200,250)-MP / VP80BV-(200,250)-MP MaxSeries multi-port venturi vacuum pump is presented in 2D drawings, with all critical dimensions and port thread sizes displayed. Both imperial and metric units are included. Performance data for the VP80-(200,250)-MP / VP80BV-(200,250)-MP MaxSeries multi-port venturi vacuum pump is displayed, listing air consumption, vacuum flow at various vacuum levels, and evacuation times (for 1 cu. ft. or 1 L volumes). Data is presented in tabular and graphed formats, in both imperial and metric units.